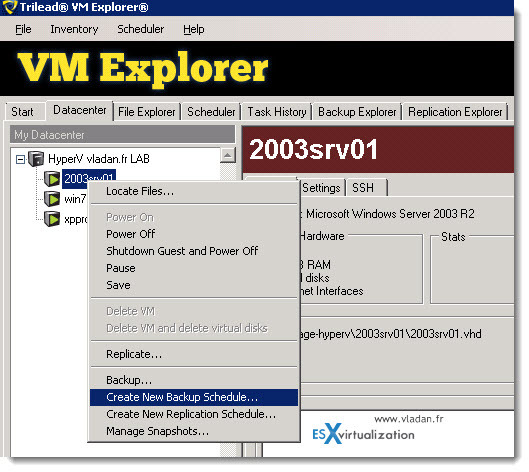 New version of VM Explorer from Trilead – v. 4.0 which supports VMware vSphere and Hyper-V. Trilead is now part of Microfocus software. So Trilead VM Explorer is not developped by intependent developpers by rather a Microfocus team. 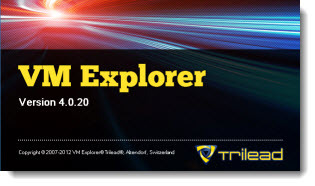 Trilead VM Explorer 4 has been released few days ago and I have been asked to do a product review. Since the product has Hyper-V support, I installed Hyper-V host in my lab in order to test the Hyper-V backups. 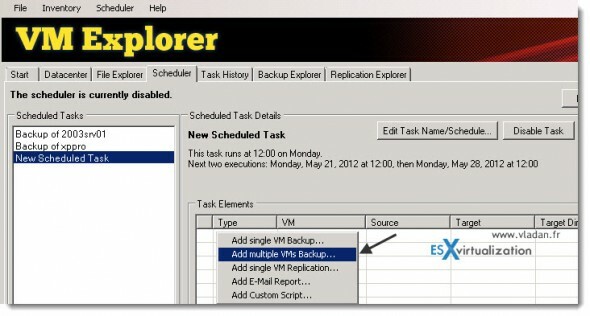 VM Explorer 4 does provide VMware vSphere and Hyper-V backups from one small msi package weighting 13.5 Mb. With this one tool you can manage your backups, restore operations, replications and also file level restore. If you run production environment with those two hypervisors, you might be interested in this tool since the licensing options are unique. In fact to license VM Explorer, you don’t pay per physical socket, but per installation. It means that with one license you can, in most cases, backup the whole virtual environment. If you’re running older vSphere Environment, below you can find the versions of ESX/ESXi that are supported to use with VM Explorer 4.0. Hyper-V Server 2008 R2 (SP1). Now Let’s start with the review. As I said in the beginning of my article, for this occasion, I have temporarily transformed one of my ESXi 5 hosts into Hyper-V host. I disconnected the USB stick, where my ESXi 5 is installed, out and installed a copy of Hyper-V on one local SATA hard drive. I will be running a couple of Hyper-V VMs on another local disk on that host. 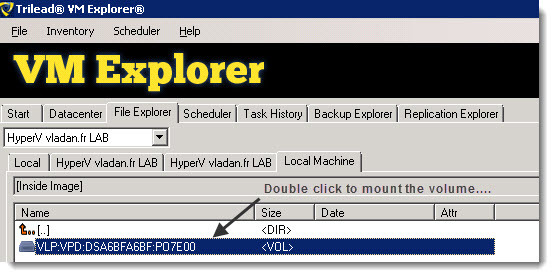 The VM Explorer 4.0 will be installed on the same physical Hyper-V host and the destination of the backups will by my drobo device which is connected via iSCSI. The iSCSI network for this test is completely isolated gigabit network going through small gigabit switch. Only one host and the Drobo device are connected through this switch. 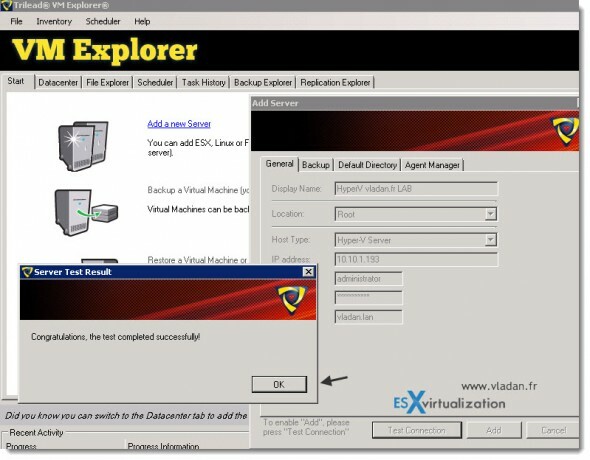 Trilead VM Explorer is small in size product and the installation took only few seconds (after the required step of installing .NET 4.0). The default screen provides you with option where you can install the product license, or start with Free version. See the differences in both editions in this page at Trilead’s website. I have requested a trial license through e-mail. This trial expires after 10 days, which might be a bit short for someone, but I’m sure you can ask for another one if you need to test this product further. On the image below you can see the initial connection to my Hyper-V host and other possibilities. You can click on the image to see larger view. Once the server type is selected, you have to click on the Test Connection Button, in order for the Add Button to became active. You’re asked about the connection credentials, domain and IP address of your host. All this takes like 3 seconds. You can’t really make the setup process more easy. I definitely have more work with the screenshots here than you on figuring out how to get started… -:). Once the Hyper-V server added to the dashboard, it’s possible to create a first backup. I started with a right click on one of my VMs and as you can see, one of the options is for scheduled backup. I took that option. The next screen let you choose the backup schedule and the location of the backups. You have many options there, but most of the time one daily backup will usually fits your needs. There are also options for weekly or monthly scheduling as well. For more granularity through the day you can also configure incremental backups with the possibility to backup up to every hour, with retention of up to 50 incremental backups. This is the maximum of incremental backups before one full backup is made. Please note that when you finish building your backup job, you must click on the button on the right hand side to Enable The Scheduler. Otherwise the backup won’t start. Once the scheduler enabled, the backup job is ready to start at the time that you scheduled. As I said in the beginning of my article, the target backup directory is my Drobo device which is connected via iSCSI to my physical Hyper-V host. So in my Server Manager you can see the connection to the remote iSCSI storage as an E: drive which looks like local hard drive, but it’s a remote network storage. You can see the setup of my disks which are present at my Hyper-V host at the screenshot below. The Trilead software has been installed directly on the Hyper-V host, which is a 2008R2 Standard edition with Sp1. This lab setup performed remarkably well and with some great speed. Probably due to the setup which was running those VMs from one local SSD drive and because a dedicated gigabit network was used for the destination location. To give you an idea, I have backed up a Windows 7 client OS. The first backup took only 3 min 25 sec (Note that that the OS is clean, no applications – but the VHD file is is 9.6Gb in size, still). At the destination the VHD file gets an extention DELTA which is a VM Explorer’s file extention for incremental files. You also have the possibilities to select multiple VMs to be backed up. You can do it when creating new backup task, with right click > choose multiple VM backup. Individual File restore – This option enables you to restore file which was located inside of a VM. Inside of the Guest OS. The easiest way to restore a VM or single file is to go through the Backup Explorer Tab. There you can see which VMs has been backed up and how many restore points or full backups has been made for each job. 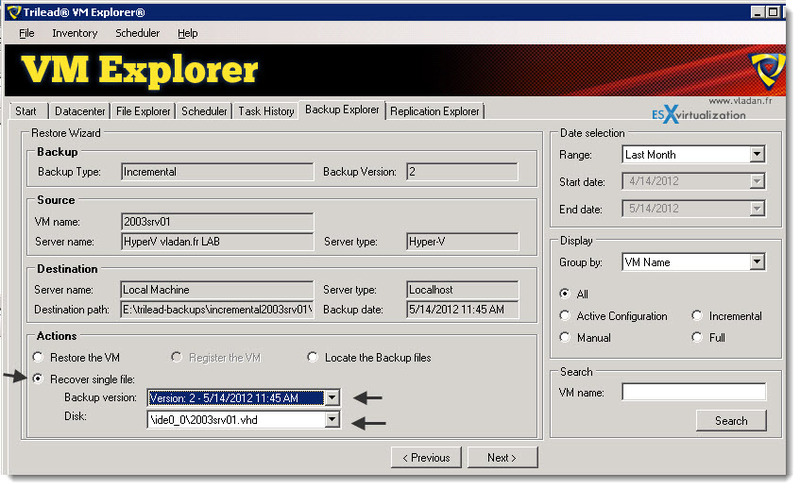 When chose the Backup Explorer, you have already access at the bottom to the Next Button. Immediately you can go to the next screen, where you have several radio buttons. – Restore Individual Files from different virtual disks (in case that you have more than One). I tested both without problem. The first option (single file), brings another window, where you just double-click the volume from which you want to recover the individual file. And with right-click > copy, you have the possibility to paste to the location you want. After navigating to the folder from which you want to recover your file, you have one right click option – COPY, as you can see on the screenshot below. 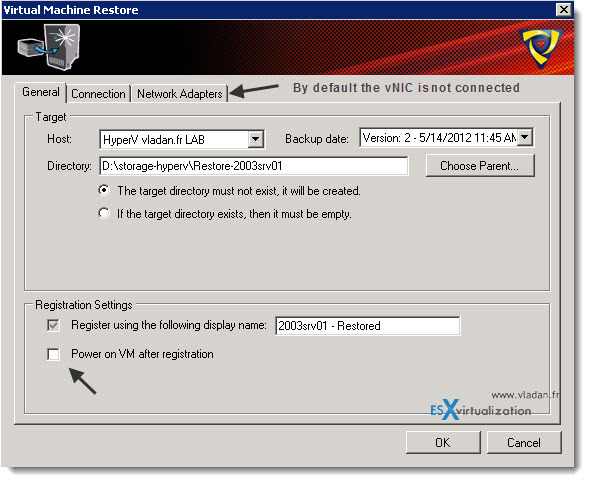 Full VM Restore – this option enables you restore the whole VM. If the VM which you want to restore still exists, you must specify different name for the restored VM. Also, there is an option to power On this VM after restore and not connect the virtual network card (vNIC). Those are the default options. The restore operation runs as smoothly as backup. No issues here and I can say that I was very nicely supprised with the speed of the restore, again. Here you can see the Hyper-V server manager with two restored VMs which has been powered on immediately after restore and automatically started. Concerning the speed of restore and backup operations, you can see another screenshot below showing the runtime of those operations. If you click to see larger view, you would be able to see, that except the Windows 7 Guest OS full VM restore which took over 3 min, all the other jobs (backups or restore) runs very quickly under a minute. As said in the beginning of the review, the tool can handle VMware vSphere and Microsoft Hyper-V backups and replications. Adding vCenter to the dashboard takes few more minutes. Add vCenter > you’re asked for vCenter credentials > double click each of the ESXi hosts to setup ESXi credentials. You’re done. Reporting through E-mail – There is a possibility to configure E-mail reporting for each job as well. There isn’t a simple check box, like one would usually look for, but you must right-click in the job window to add another task to the job. And this another task is the e-mail report. A bit unusual, but in the version 3.5 it’s been already the same way. It might get changed in the future release, since I think that simple check box when configuring backup/replicate job, would be sufficient. If you go and fill in your e-mail details (SMTP, sender, receiver …) in the File > Settings > E-mail TAB, and validate there, then you have the possibility to get those values populated when adding the E-mail report task to the backup job. There is a button called for that, so you don’t have to fill in those values again and still have the possibility to send the report to another person instead of the default one. I haven’t been able to cover the replicate feature since in my lab I had only one physical Hyper-V host. The replication feature for Hyper-V works the same manner as backup, where you have the possibility to choose the source host and the destination host for the VM which needs to be replicated. Plus there are other TABs where you can configure the shutdown/replacement of the destination VM on the remote Hyper-V host. The product, as in its previous release which I was reviewing (the 3.5 release) stays simple to install, setup and use. The configuration, the look and feel gives great users experience with minimum hassle when setting up. You can be up and running within minutes. The simple licensing of the product is per installation and not per physical CPU socket (or even per VM pack). This opens another possibility in a niche market where backup tools for virtual infrastructure does cost less than the competition. The product can’t compete with products providing more features, like AD, SQL or Exchange Server Individual items restore. But not every environment needs that capabilities either. 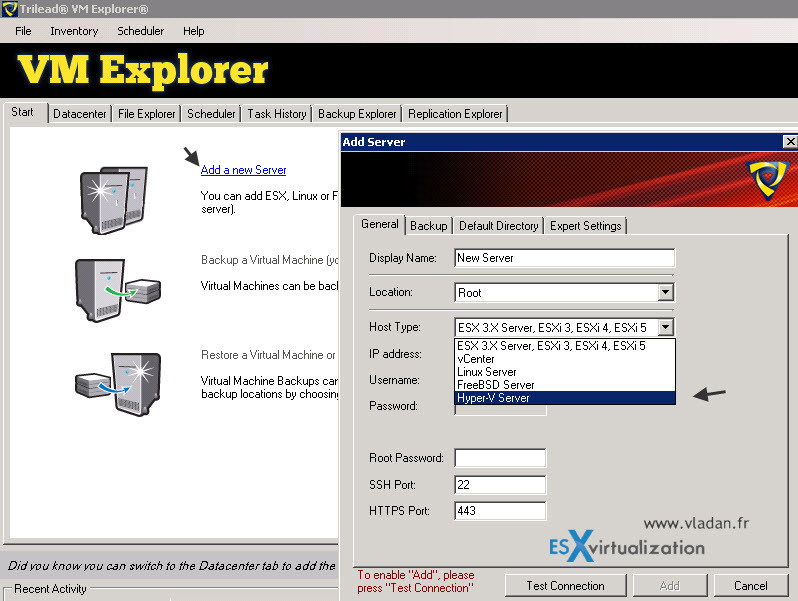 There is definitely place for tools like VM Explorer 4.0, which can cover environments where the individual item restore might be handled by other product or by the application itself. Trilead grew up with this release bringing support for Hyper-V, which we might see to be more present in testing/production environments. 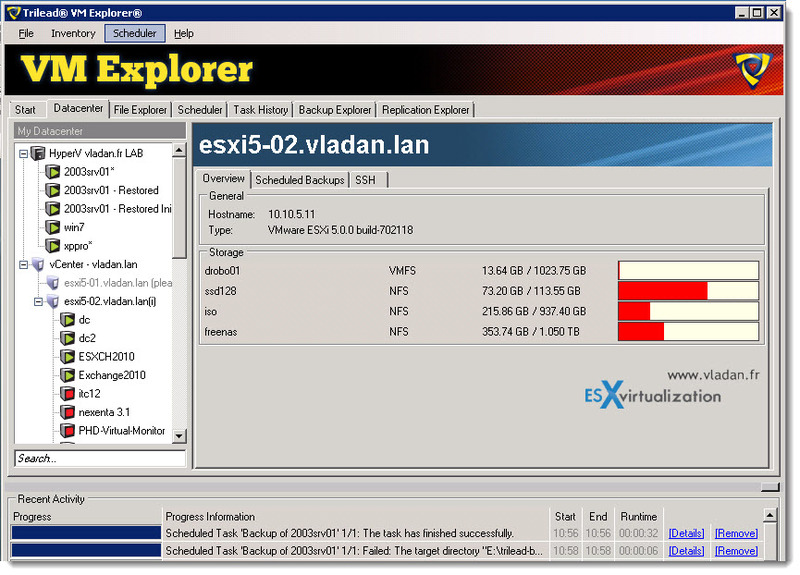 Note: Please note that this detailed review of VM Explorer was sponsored by Trilead. Hello, I want to backup an AD virtual machine running on Esxi free with the free product,I mean trilead ,but I am not so sure about it. Can you help me with a little advice? it is a windows server 2008 R2 virtual machine, the only one,because we are in a small env. and the budget is very very low.